If you missed last week I showcased Halloweens past thru the years. I asked if you could guess what theme my kiddos would be this year. Did you guess a butterfly and bug catcher? If so you would be right! Little Man wore it until it was time for trick or treating, at which time he transformed himself into some scary scream guy. So, there ya have it. Another Halloween down. How was your Halloween? Have many smiles? If you missed my Project Smile party, it's not too late to share your smiles. It's open until November 6th at midnight. Thanks for stopping by! Happy Hump Day! Let's get this party started. Shall we? Add your link below and then head over to some of my other bloggy friends... Kristi at Live and Love Out Loud, Amanda at Parenting For Dummies, and Susan & Janice at 5 minutes for mom. P.S. Shibley Smiles put together a fab list of Wordless Wednesday hosts. If you want to hit all the hot spots, check it out. how unique their costumes were. I like them a lot! Thanks so much for the shout out about my list. And as usual awesome photos do you ever take a bad photo? Or maybe you just don't show us! Love that butterfly costume!! What great Halloween memories!! Cute pictures, and great costumes! I love the head shot of your daughter in the third row...she is absolutely beautiful! I wish my daughter would pose and smile for me when I try to take her picture. Love the collage.. They look too cute. Happy WW. Love the idea of their costumes! The butterfly costume is stunning! And I love her little catcher. So creative!! I love the butterfly costume.. so lovely!! Not sure if scary costumes get more sweets as I'm more inclined to give sweets to kids with cute costumes. We have to bundle up so much here in Canada, our choices are sort of limited. I ADORE those costumes!!! So creative and darling! The butterfly is fantastic. Amazing shot as always. What do you use for your collage layouts, if I can ask? Love it! I love how friendly and welcoming your blog feels. Feels like coming home to an old friend's place even though I just found it today! Thanks for the good vibes! I, too, love your butterfly. The photos are great, too. You've captured so much personality. Also funny to see the stages of Halloween through the eyes of 'tweens! Love that they will dress up together! So much fun! I love this year's matching costumes - what a great idea! I am so not looking forward to when my kids want scary costumes - my oldest is already asking to be a vampire next year. Sigh. Amazing! Did you make the costumes? your daughter is so pretty as the butterfly. And your son was very dapper as a trapper, what a Huge net! 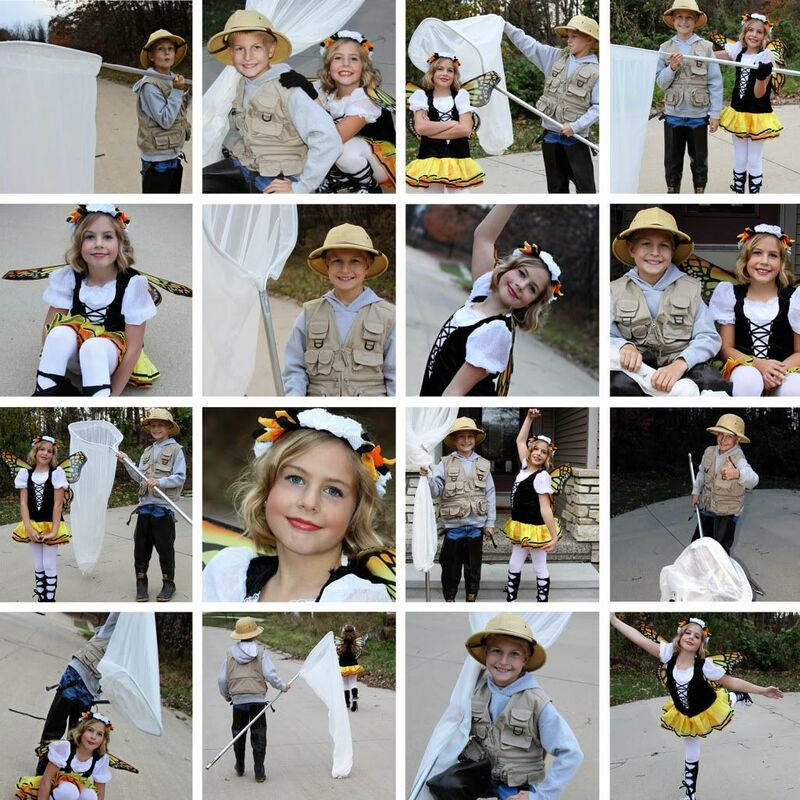 I love the butterfly and bug catcher costume. It is a clever costume pair without being too common. Love it. Awesome costumes! By the way, I love Pokey's hair. Did she get it cut again? Oh and the scary costumes...they don't get any better as they get older. My son always wants to be something bloody and scary. Blah! What a great team.. Love it. Hope she got away,lol. How fun!!! Love her butterfly wings, so pretty! What fun pictures love all the costumes. Precious photos!! Love the costumes, amazing! This is such a great idea for costumes. Very original and adorable! These are all so precious. Thanks for sharing. Looks like they has loads of fun. I love the costumes. What fun photos Alicia. And great costumes. Your kids are lovely and the costumes are brilliant! You came up with such unique costume choices. Really cute. I love their costume choice! Was your daughter right? Did the scary costume get more candy? For my part, I always reward non-scary and creative costumes with more candy. Looks like they had a great night! Great photos. My granddaughter did the same thing. Had two costumes going. Love your kid's costumes. Especially the bug catcher. Totally understand the scary costume theory. But I always give the cute ones more, so tell her that! My tween was sooo stoked about trick or treating until one of her older friends from the neighborhood walked by (costumeless)... then suddenly, she became embarrassed! Looks like a great Halloween. Love the costumes! Great costumes. 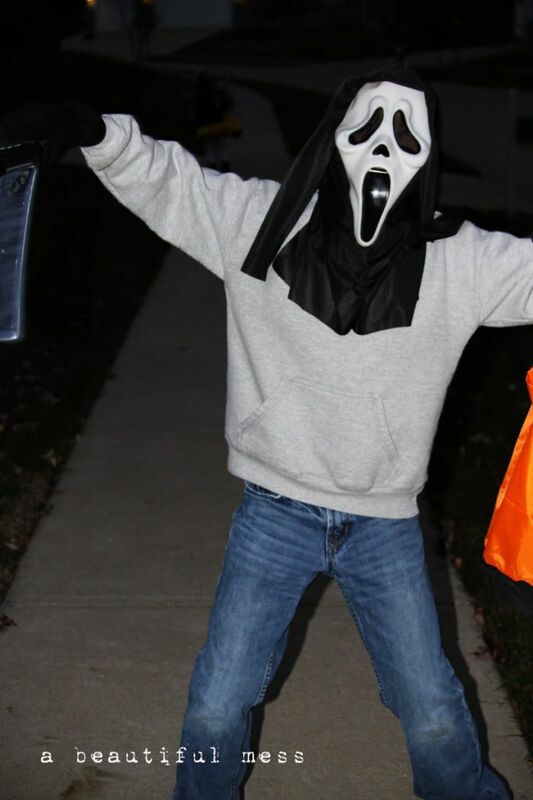 Love the Scream costume. They were absolutely gorgeous costumes. Your daughter is the prettiest butterfly I have ever seen, seriously. She looks like a ballerina ready for recital. Looks like a terrific Halloween! Great collage! Those costumes are genius! Love it. What awesome costumes! Love the matching themes--- I kept the kids as separate themes this year but will pair them up next year! looks like a lot of fun at your house! Your kids are adorable! That butterfly outfit is just amazing. I sort of wish I had one of my own. Perfect idea!! This totally put a smile on my face! Oh my gosh! They look so awesome! I love the butterfly costume! I'm back to link up :) Happy WW..thanks for being such a gracious host. Mine is super cute today! What a wonderful idea!! Of course he had to change into something more scary.. lol! What a great series of pics! Great pics as always. Love the bug catcher costume - it's so much more creative than the scream mask! And that is one GIANT net!! I love her butterfly costume - she's the most elegant (human) butterfly I've ever seen! I love group and pair costumes - so much fun! They look great. We had a lot of those scream guys come to our house. Boys will be boys. i love how you have them go in pairs..
that makes them so much more creative in my opinion! Beautiful photos! I love the pair costumes, so clever. Your children are such a reflection of you. I tried to leave a comment last night and I don't think it ever worked. Trying again! I love your costumes!! So creative! I also love your photo collage! Looks like you had a great Halloween!!! Love all your fun photos!! Very beautiful butterfly! I saw lots of them at the Renaissance Festival. So cute! same w/ my 11yr old - wore a scary mask and brought home a LOT of candy. They both look fabulous! I love the creativity on the costumes. My little one was one, as well. Just with wings and a headband/antennae ... but lots of flutterbyes this year! Your kids are just beyond beautiful. Those costumes were great! Adorable butterfly and catcher. Great pictures. I can't believe you got a tween boy to dress up for pictures. That is a work in itself. He made a great scream guy later. But, her make-up takes the cake, it looks perfect with her outfit.